Do you know the significance of the rainbow? The rainbow is one of the many beauties of creation, but you may not be aware that it is connected to an important promise of God. Most people, even those who aren’t Christians and have never studied the Bible know the story of Noah and the ark. The story of Noah is not merely a “story”. Rather it is a part of history or “HI-S-TORY”. It is an important part of God’s story of the history of the world which He recorded in Holy Scripture. 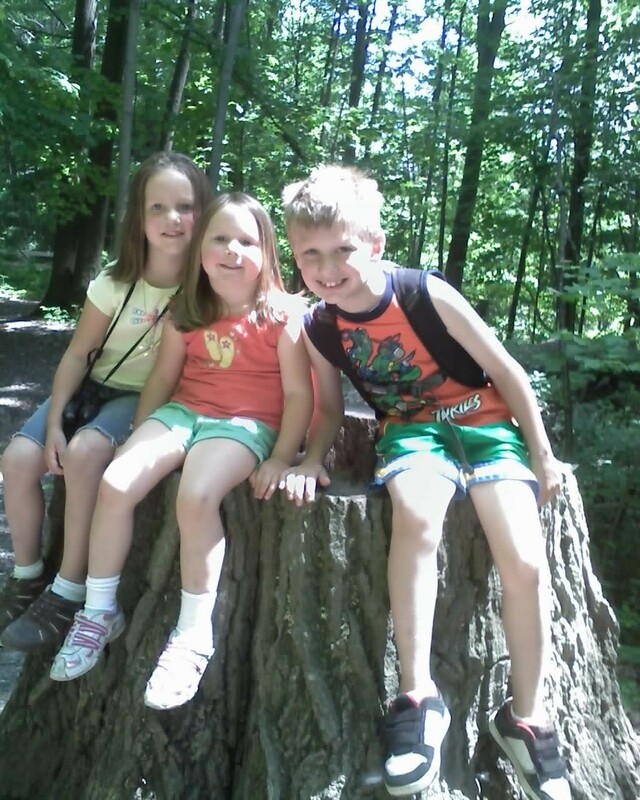 One Saturday several summers ago my husband and I had three of our grandchildren with us for the day and the plan was for them to spend the night. It had been a busy but fun day. We had gone to the pool to swim and we had been to the pond to feed the geese, ducks and swans. We had just finished eating dinner and the plan was for us to go to McDonalds for ice cream. There had been storm warnings off and on during the day, but between storms the sun would come out and all would be well for awhile. As we pulled into McDonalds, another storm was brewing. It was beginning to thunder and we saw lightning flash across the sky. The storm blew through while we ate our ice cream and by the time we were ready to leave the sun was coming out again for one last time before it set for the night. To the west the sky became a beautiful shade of pink. To the east it was still very dark, almost black with the storm clouds which had just passed over. 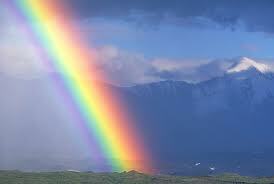 It was raining from those dark clouds and as we looked heavenward we saw a beautiful rainbow. It was a huge arc all the way across the sky. Each color (red, orange, yellow, green, blue, indigo, and violet) was vividly present against the back drop of the black clouds behind it. 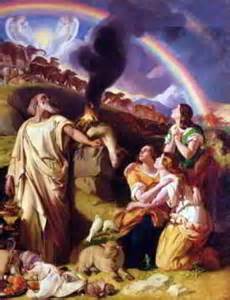 The children, being aware of the significance of the rainbow, were quick to tell us the story of Noah and the flood. Although my husband and I already knew the story, we were happy to listen as they told us about the promise of God connected to the rainbow. God was very angry and fed up with the wickedness of the people He had created. He could no longer tolerate their evil ways and He planned to destroy them. So the Lord said, ‘I will wipe mankind, whom I have created, from the face of the earth’. Not only would he destroy humans, but also the animals, and creatures that move along the ground, and the birds of the air (vs.7). But there was still one man who remained faithful to God. His name was Noah. God says about Noah; Noah was a righteous man, blameless among the people of his time, and he walked with God (vs.9). Noah also had three sons: Shem, Ham and Japheth. God came to Noah and warned him; I am going to put an end to all people...I am surely going to destroy them (vs.13). He commanded Noah to build an ark. He specified the exact measurements and materials, and how it was to be built. Then He told Noah; I am going to bring flood waters on the earth to destroy all life under the heavens...Everything on the earth will perish (vs.17). But He promised that Noah and his wife, his sons and their wives would be safe in the ark. He also advised Noah that He would send to him, two of each kind of animal (male and female) and each kind of bird of the earth to be brought into the ark and kept alive. He instructed Noah to store enough food for the animals and the people (vs. 19,20). We are told in verse 22; Noah did everything just as God commanded him. Scripture states that Noah was 600 years old when God sent the flood to destroy the earth. All the springs of the great deep burst forth, and the floodgates of the heavens were opened. And rain fell on the earth forty days and forty nights. (Genesis 7:11,12) Not only did water fall from the sky, but it came up also from springs beneath the earth. The water remained on the earth for 150 days (vs. 24). Even after the water had gone down it took many months for the land to become dry enough to be habitable again. God is God. He is all-knowing, present everywhere and all-powerful. He doesn’t need reminders. But we do. The rainbow reminds us that God is close by even though we cannot see Him. It reminds us that His promises never fail. It is a picture of just how big God is compared to us and this little planet we live on. 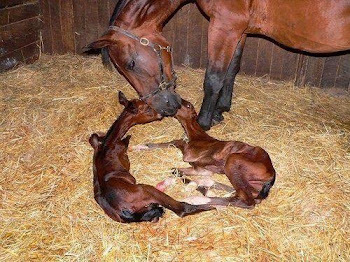 It also reminds us that the life of every creature is in His hands and it tells us that the true God is a God of beauty and love. Hearing our grandchildren reflect on God’s rainbow promise reassured me that they, having been taught God’s word, have grown in faith and truly believe His promises. It is a picture of the child like faith which Jesus talks about in Matthew 19:14 when he says; Let the little children come to me, and do not hinder them, for the kingdom of heaven belongs to such as these. Children have a trusting spirit. They don’t question God’s word. They are eager to learn, and they believe with trusting hearts. Do your children know the story and the meaning behind the rainbow? If not it’s time to tell them about it. There is no better time to teach them about God and His promises than during childhood. They deserve the chance to learn and know that God loves them. They will soak up the knowledge like a sponge. They will be able to take comfort from it in times of trouble and sadness. 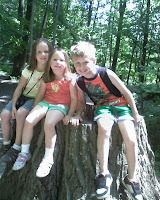 They will be little missionaries eagerly telling others about God and the wonderful things He has done for all people. When they see the rainbow in the sky they will know and be reassured that God is close by watching over them, that He will never forget them, and that He always keeps His promises. In His holy name – To God be all Glory! Amen.